Thank you, Aria! 🙂 Glad you liked. Perhaps not quite as colorful as your gorgeous petunias, but . . . Sad their lives are so short, but I suppose not for them, only me. Nice one, Barbara! 🙂 Thanks for sharing! I hear ya, ekurie. I like to think they are somewhat conscious of their existence, but I have my doubts they are aware of Father Time. Good to see someone reads me. 🙂 Thank you kindly, Brian! Yes, Brian. 🙂 When I put a pic of him on Facebook, and old friend filled me in. I used the name as a TAG here; just goes to show how much tags are worth. But, hey! If Google search engines pick up on it, it’s worth it. No matter what, cool moth! My cat was freaking looking out the window at it. Does your dog eat them, or just bring ’em in for a play toy? Thank you, Annica! 🙂 Glad you liked. 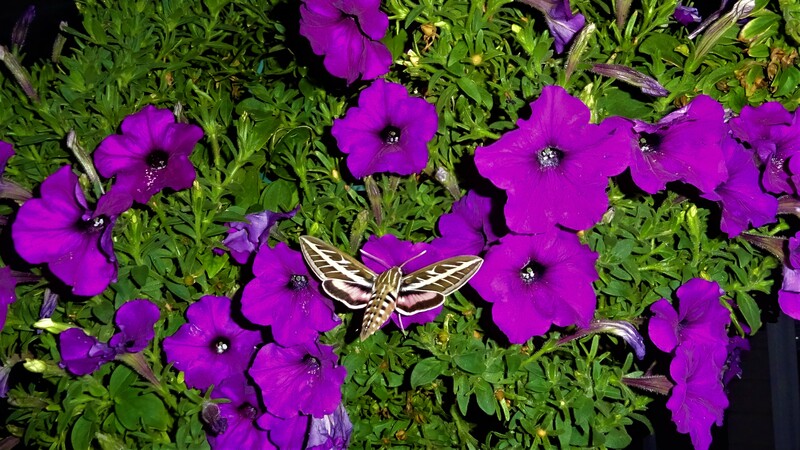 Amazing moth and you have the most beautiful flowers Uncle Tree. 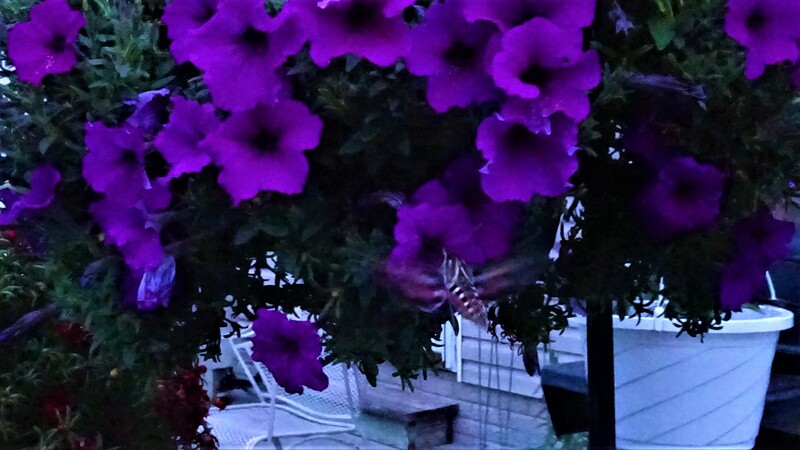 These vibrant purple petunias that show up even in the dark. Thought of you as we have the Perseid meteor showers this weekend. Did you see any in your neck of the woods? The story on the radio suggests that we go 20 miles away from the City to view them the best. Thank you kindly, Linda! 🙂 Glad you liked these shots in the dark. I’d never used the flash before, but after a few normal tries (the last two pics), I realized it was too dark outside (9 pm). 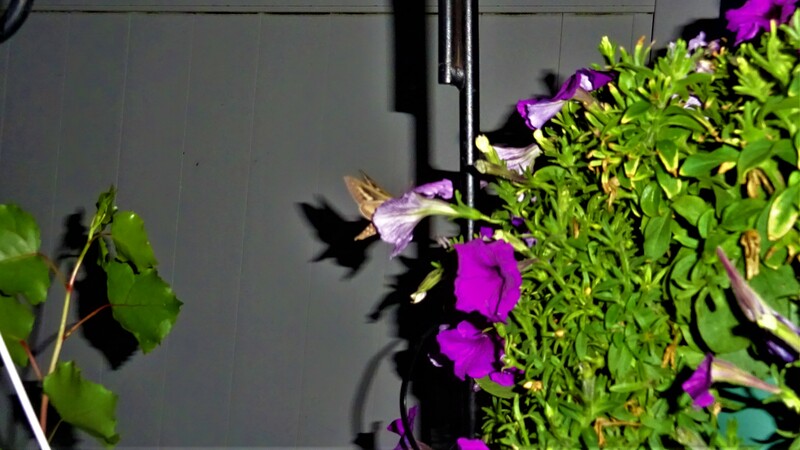 With the flash, the shutter worked quickly, and almost seemed to freeze the moth in position, with way less hummingbird-like blur. The Perseids and I go way back. I’ll leave you a link to my story (much of it told in the comments). Right now, the smoke from all the forest fires out West have polluted our skies, so much so, they’re not even blue. I couldn’t even see Mars this morning, and their are no clouds whatsoever. Very strange, and without any wind, I’m sure we’ll be shut out again tonight. LoL 🙂 I already shared it with you, I see now. Thank you, angelbeam! 🙂 So glad you liked this. The shots in the dark were good – but you had good fireworks shots as well from the Uncle Sam Jam and you said you used a special setting for fireworks that time. We had an Uncle Sam Jam as well – not near me and don’t know if they had fireworks at. I did see this link before and it was quite a miraculous story. You were lucky to have seen it and lived to tell about it as you never know where it might have landed. When we had the meteorite here in SE Michigan earlier this year, the sound of it hitting the earth made me think someone was at the door. It was dark, and my side door, so I was concerned. I heard yesterday that the smoke from the fires will stretch all the way to the East coast. Just incredible and such a waste of lives, property, natural habitat and wildlife, especially in the case of the arsonist. I have no words for that Uncle Tree. 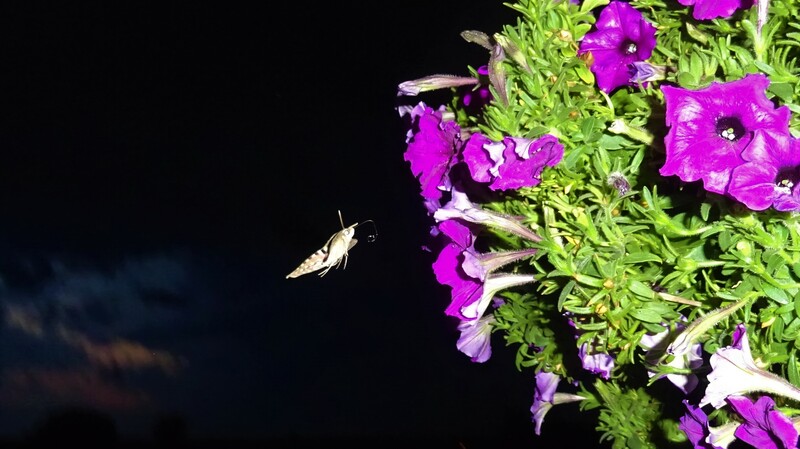 Super photos..quite feat to catch a moth in action at night, clearly, in focus, and vivid. Beautiful. Lucky to have found one. “It never rains in California,” so I have just one word: insurance. Thank you kindly, George! 🙂 I was surprised they turned out as well as they did. Thank you so much, Maria! 🙂 I spend a lot of time looking out our back window. Sadly true – I always understood California, namely San Diego, had the most sunny days in a year, but then a friend and his wife here in Michigan wanted to retire somewhere warm and he researched and found Las Cruces, New Mexico holds the record for most sunny days in the U.S. They moved last October and just experienced a monsoon season (who knew if they had so many sunny days??) But it may get over 100 in the Summer, but they have very low humidity. Thank you kindly, Jill! 🙂 Glad you liked this one. Glad you like the best of both worlds, Julie. 🙂 Thank you! Thank you, Amy! 🙂 Much appreciated. UT, incredible shots and colors, and then comes the perfect line to match a great shot: “My one true love…quickly! Where did you hide my Viagra?” Perfect! Your lyrical words and photos flow so well, which makes coming back to WP after such a long time away so worth it. Cheers to a great remaining part of the summer to you and yours, and keep the camera close and words flowing! Cheers, Randall. Thank you kindly, Randall! 🙂 Glad you enjoyed this one. Great to see you here again. Have yourself a fantastic summer! what kind of moth is that UT? It’s like a small bat! 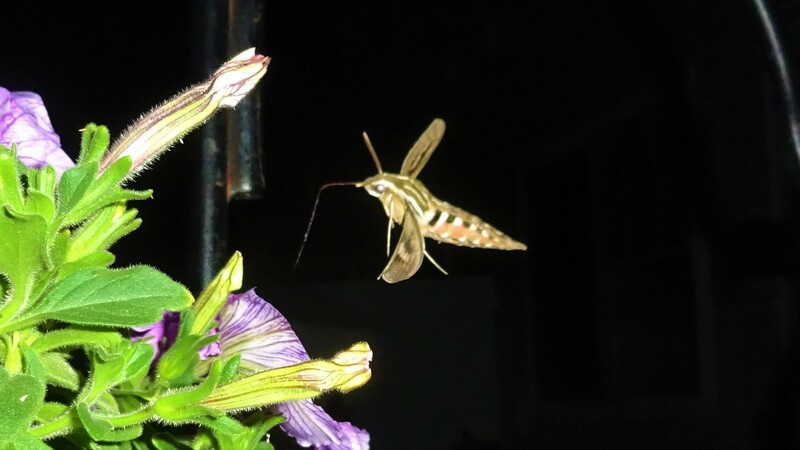 Also known as a Hawk Moth, or Hummingbird Moth. oh yes,I remember those guys.They are very large. but could still hover in place, well…trump that! I have tried unsuccessfully to photograph these moths-they never sit still long enough, and I have not managed to capture them in flight. 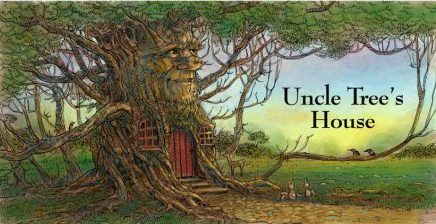 You did an amazing job, Uncle Tree. And composed a poem on top of it. Well done! Thank you kindly, Tanja! 🙂 So nice for you to say. Thank you kindly, DiAnne! 🙂 Good to see you again! 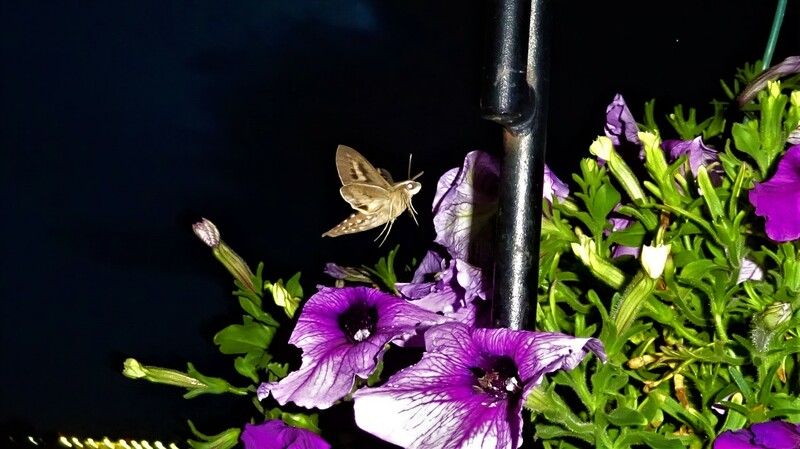 Lovely story 🙂 The moth photos are gorgeous. We have them too, but not where I live. Thank you very much, Inese! 🙂 It was a fairly rare sighting. Love it! These moths are the best. 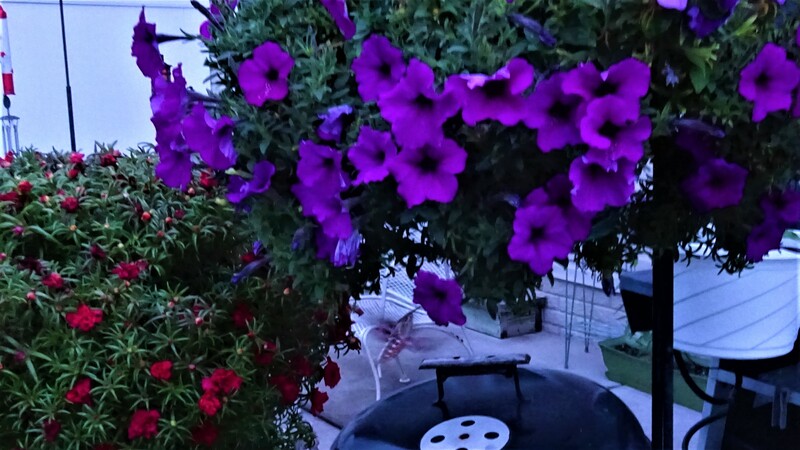 Your picture with the petunias just pops with color – beautiful! Thank you very much, Pam! 🙂 I get a big kick out of any cool sighting. Glad you liked these, Margaret. 🙂 Thank you very much!